Markets are turning lower with the financials leading. Both the DOW and SPX are still in their potential bear flags, but heading back towards the bottom. 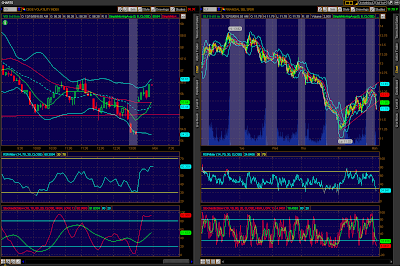 Here’s a 5 minute snapshot of the VIX on the left and the XLF on the right. The red line is the bottom of the large triangle and you can see that the VIX is moving up, away from the bottom – so far. The XLF has clearly broken down out of its bear flag. The target on that is quite a bit lower, sub $10. That’s certainly not bullish, but I’m going to remain somewhat cautious here.